I hope you click and read. It speaks so clearly to how my life has changed in the last three years and I didn't feel I could leave any of the things on last year's list out of my Thanksgiving this year. And the story preceding the list is, and always will be, relevant and meaningful. To continue the tradition for this blog that I started last year, I have compiled a list of my "thankfuls" this year. I am thankful for the best team of doctors for Marissa we could have ever hoped for. Even though one of the major players is leaving and will no longer be caring for Marissa, (I'll blog about this later) we have been so blessed to line up such caring individuals to look after her health and well being. They have played a major role in keeping her one of the healthiest trach kids I know. I am thankful for Marissa's health. Her last illness was *gasping and knocking on wood* February of this year. She hasn't had even so much as a sniffle since. I am thankful to be able to play with Marissa. She loves to play all sorts of games, most of which she has cooked up in her little brain. Such fun. I am thankful for Marissa's laugh. She has the best laugh I have ever heard on the entire planet. I am sure someday, world famous scientists from around the world will study her laughter for its healing properties. I am thankful Marissa has done well enough this year to be discharged from physical and occupational therapies. It was one year ago, November 13, 2008, that she took her first independent steps. We haven't been able to slow her down since. I am thankful for Medicaid. It kicked in at the beginning of this year as a secondary insurance for Marissa and we have not paid a medical bill for her since. It has made a world of difference and has been a major help in keeping our heads above water. She sure is an expensive lil' tyke, but worth every penny. I am thankful to have had two Sister's Weekends in the last year and I hope many more are in store in the coming year. Katelynn and Michelle are two of the best friends I could ask for and I am so lucky to have been able to spend some good quality time with them doing crazy girl stuff. I am still catching up on my sleep from their visit last weekend! I am thankful for a Summer that was filled with lots of friends and fun activities. Since we try to keep Marissa isolated during cold/flu months, and because this year she was able to enjoy fun activities and little friends more than ever, we took full advantage. It was great!! 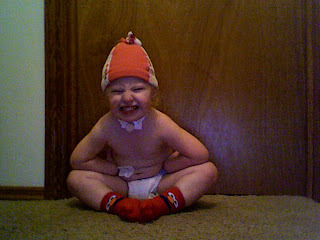 I am thankful for Elmo and Signing Time videos, Band-aids and Neosporin, nap time and date nights. 'Nuff said. I am thankful Marissa seems to be a relatively normal developing toddler. She is doing mostly age appropriate things as far as learning and development, and we couldn't be happier for that. Even though I could really do without the terrible two behavior, I am even thankful for that because it shows she is developing normally. I am thankful for a forgiving God. I stumble more often than not and it keeps me getting up everyday and trying again knowing that He loves me no matter how often or how badly I fail. I am thankful for a forgiving husband. Our lifestyle has caused some major stress in our relationship and I know I am not the easiest or nicest person to live with. He has stuck with me through it all and I can't thank him enough for that. I hope you take time to pause this holiday season to consider all the ways your lives are blessed and what you are truly thankful for. God bless you all and have a wonderful Thanksgiving. Once a sensory kid, always a sensory kid. Marissa had a memorable encounter with a patch of snow yesterday. It snowed last weekend, and seeing as how we do not have boots and snow pants for her yet (I seem to go shopping for them after everybody else on the planet already has), we did not take her out in it. 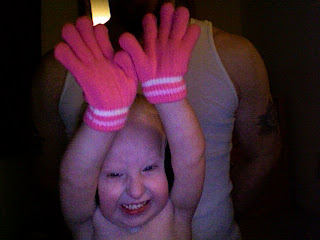 Yesterday was a nice day in the high 50s and Marissa was itching to get out and about in the backyard. Because of the way our house is positioned, every time it snows, most of it melts pretty quickly except for one strip in our backyard near our back fence. I decided to take Marissa to that spot to see how she would react with the snow. She was a little hesitant to walk in it at first but quickly overcame that and started running around in it. The problem arose when she slipped, fell forward onto her hands and was forced to touch the snow with her bare skin. Now, I know that even though Marissa was discharged from OT during the Summer, she still has lingering sensory issues. We try to keep her acquainted with her biggest icky sensory substances such as sticky, goopy, crumby, foamy, creamy and so on. We have learned that once she "conquers" a substance, she will regress if we don't push her to keep touching it. This happened recently with her feeding therapy. She had been taking some bites of a biter biscuit and it was leaving crumbs on her tray. Apparently, we hadn't worked with crumbs in a while because she looked at her hands with all the crumbs on them and started to gag. We just need to stay on top of her sensory processing issues and keep her acquainted with all the "yucky" stuff. The good news is that once she conquers something, as long as we keep her touching it on a regular basis, she tolerates touching it very well. In fact, after she recovered from her snow incident on the good ol' patio swing, she was begging to go back out to the snow patch! This is her requesting to go back out to the yucky snow patch. Several times while we were out there, it looked like she was going to reach down and touch the snow again. She never did and I didn't feel like pushing her but she sure contemplated it. I am so proud of my brave girl. I can't imagine how scary it must be sometimes to have sensory processing issues. She is so brave to push herself to overcome them. I just pray that Mother Nature cooperates with us this Winter and gives us enough of the white, fluffy, yucky stuff to keep pushing Marissa's thresholds. It is really strange to think about what caused our stress back in the day versus what causes our stress now. Two years ago, we were still rookies in this game. Not only were we first time parents, we were still learning all about the world of special needs. The things that caused us the most stress two years ago were things like learning to be comfortable with Marissa's trach, g-tube and how to care for them, how to deal with insurance companies, DMEs, doctors and therapists. 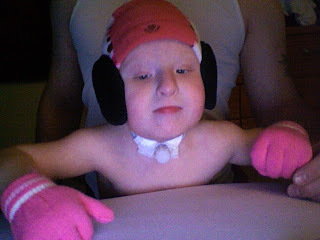 Today, we are completely comfortable with her trach and g-tube. 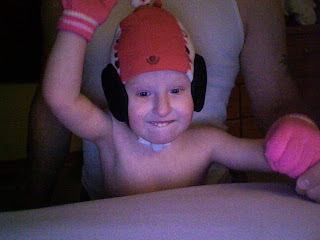 We have settled into a routine when it comes to her "accessories" and other equipment. We figured out that she is a rough and tumble kind of girl and we don't have to stress out if she bumps her trach on the table or scrapes her g-tube on the bed when she is trying to get down. Her "accessories" are just a part of her now. I am more comfortable in dealing with insurance, DMEs and doctors. I know how to handle talking and negotiating with them when I need to. It feels like we have been living this life for years and we no longer stress about things related to her special needs like we used to. Nowadays we stress about her behavior. Just to be clear, I don't think she has any special behavioral issues at this time. I just think she is a typical toddler who is trying to discover who she is and her role in the world and she expresses it in a typical toddler way. Which bugs the dookie out of me!! She is very strong willed, loves to ignore and disobey even when given consequences. Just last night she was put in time out for hitting the glass back door over and over, very hard. As soon as she was out of time out, the very second she set her feet on the floor, she ran over to the door and started banging on it again! UGH!! She loves to act out in the exact moments when I need her to behave. For example, yesterday I was on the phone with the lady from the Early Childhood Education department of our school district talking about her upcoming evaluation. Very important stuff. Marissa decided that was the perfect time to walk up behind me and smack me as hard as she could on the arm. She also decided it was the perfect time to cause as much noise and ruckus as she could, banging on the table, yelling at the top of her lungs, jumping off the chair and hurting herself. She does this anytime I get on the phone. She also throws what I call "flash" tantrums. Everything will be fine, she'll be perfectly peaceful and obeying me and the very next second she will be throwing an all out fit. Throwing herself to the ground, flailing around and screaming. The best example of this is nap time. I always let her know what is going to happen before I start doing something with/to her. I let her know it is nap time and I need to suction her and change her diaper. Then I tell her it is time to go upstairs and get ready for a nap. I let her know that if she behaves, we can read her favorite book, "Goodnight Moon". She will be sweet and obey me. She will walk up the stairs and be fine until we get to the middle of her room. Then, all of a sudden, she throws herself on the floor, bangs her head and screams and cries like she is being murdered. Everyday. Without fail. So frustrating!!! Sometimes when I get frustrated with Marissa's toddler terrible two behavior and think I am at my wits end, I like to look back at old pictures and videos of her. It helps remind me of how cute she was (and still is) and how much she has grown up. It makes me happy and it takes my focus off how bad her behavior can be at times. I love to reminisce. I can't believe she was playing peek-a-boo at 7 months old!! Isn't she just the cutest?? UPDATE: I just got the best news!! Marissa's Ped's office just called and said that they have the H1N1 shot!!! So we are going in at 8:45 tomorrow morning to get it there instead of going through the public clinic long line mess. I actually yelled "WOO HOO!!" on the phone with the poor nurse and I think she is deaf now. But I told her she made my week, so that should make it up to her! ; ) My mood is significantly improved now. I am in a funk today, for no particular reason. Actually, it could have something to do with the fact that Marissa has been taking so long to settle down to sleep at night for about a week now. Last night, she tossed and turned for three and a half hours before falling asleep. I'm not sure why she is doing this. Just a phase, I guess. But it sure wears on J and me. And then, once she got to sleep, I tossed and turned all night. Sheesh. So, even though Christmas is still a month and a half away, I decided to post these pictures of Marissa. Because they make me smile. And I need a smile today. In unrelated medical news, I took Marissa to see her Pulmonologist last week. He was very pleased with how she is doing. Her baseline chest x-ray we took several months ago looks great and, of course, her salivagram was negative. So he looked at me and told me that he would be comfortable discharging us from his care because all her remaining issues are in her upper airway. But, he said he is curious to see us a year from now when she is possibly decannulated to see how she is doing with that. So, lets pray that she can avoid getting pneumonia this year so we won't have to see him again until this time next year. We are going to take Marissa to get her H1N1 shot tomorrow. Jeremy has the day off (Veteran's Day) so our plan is for one of us to wait in line and the other will wait in the van with Marissa. We are going to show up an hour and a half before the clinic opens to hopefully get a good spot in line. I am so thankful Jeremy will be there because I can't imagine standing in a line for that long with my girl whose attention span is shorter than that of a gnat. When she gets bored, she gets feisty!! Plus, having her stand around a bunch of people who may already be sick with something is not a good idea. We are VERY thankful our van has DVD players! Elmo to the rescue!! Of course, we'll have to do this all over again in about a month to get her the second shot. Bummer. OK, enough of my rambling. I am going to get Rissa (and myself) ready for a nap. Nighty night! !